Anyone else a fan of “American Housewife”? I personally think it’s one of the funniest new sitcoms this season. 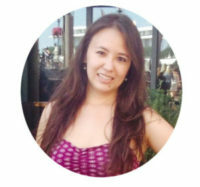 Katy Mixon is an absolute gem, as a “typical” housewife and mother living in the affluent town of Westport, Connecticut. Her character, Katie Otto, often gets frustrated being surrounded by wealthy, perfect-in-every-way housewives and their privileged children. The comedy is in how she copes with her surroundings; the heart is in her interactions with her family and how she finds commonalities with the Westport women, despite their superficial differences. Katie: (in response her daughter and friends) Look at Taylor and her friends. They are splitting a muffin four ways. Why? Because this town muffin shames women, and it starts early. Katie: (to a waiter) Can I have some cream? Waiter: Soy, almond, cashew, or lactose-free? Katie: (shakes her head) Mnh-mnh. Half-and-half. Waiter: (looks confused) Half almond, half soy? Katie: No. Half milk, half fatter milk. Waiter: Oh, I’m sorry. We stopped carrying cream. No one wants it because it’s VERY unhealthy for you. As you can imagine, Katie was not too pleased with the waiter’s response (neither was I). She’s all ready to leave Westport at this point, but has a change of heart when she realizes how much her family loves it there. There’s kind of a sweet moment at the end of the episode where the same waiter brings Katie some cream and says they started carrying it just for her. See, Katie? Westport isn’t so bad after all. I have to say my tastes are pretty similar to the Westport housewives that Katie loathes so deeply. I like eating gluten-free baked goods, drinking green smoothies, feasting on vegan food, doing yoga, and posting my life on Instagram. These activities are all things that Katie has scoffed at over the course of the show and its kind of humbling to see these aspects of my life through her eyes. This show takes on a lot of superficial stereotypes about the rich vs. not so rich, seemingly perfect vs. not so perfect, and so on, and delves a little deeper, in such a way that you end up having sympathy for both sides. Despite Katie’s dislike for all things Westport, she still manages to reach a commonality and understanding with these women and that’s really interesting to watch. What I love about Katie is that she is 100 percent unapologetically herself. She refuses to change for anyone, but she still has a soft spot for her kids (especially her youngest, the adorable Anna-Kat) and she still manages to accept the other women and the culture of Westport for what they are… mostly. 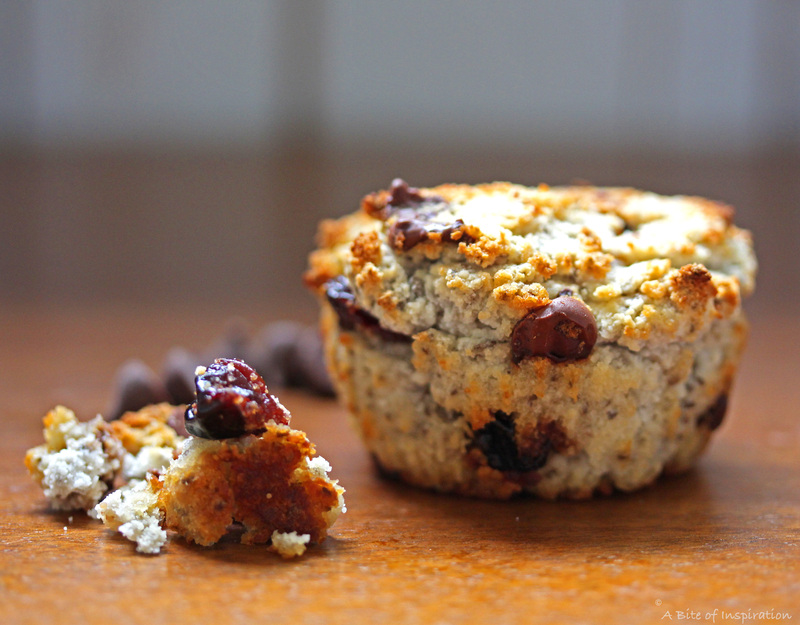 Inspired by the show, I created a muffin recipe that is healthy enough to serve at any Westport bakery, but tastes decadent and delicious, so that Katie would want to eat it too (she’s not a big fan of anything that tastes too “healthy”). It’s the perfect common ground between Katie Otto and the Westport wives. It’s a recipe that, despite their different tastes, they would all enjoy. My recipe for Gluten-Free + Vegan Chocolate Chip Cherry Muffins is made with chia seed “eggs”, coconut oil, coconut flour, and maple syrup, but it honestly doesn’t taste like a healthy muffin at all. 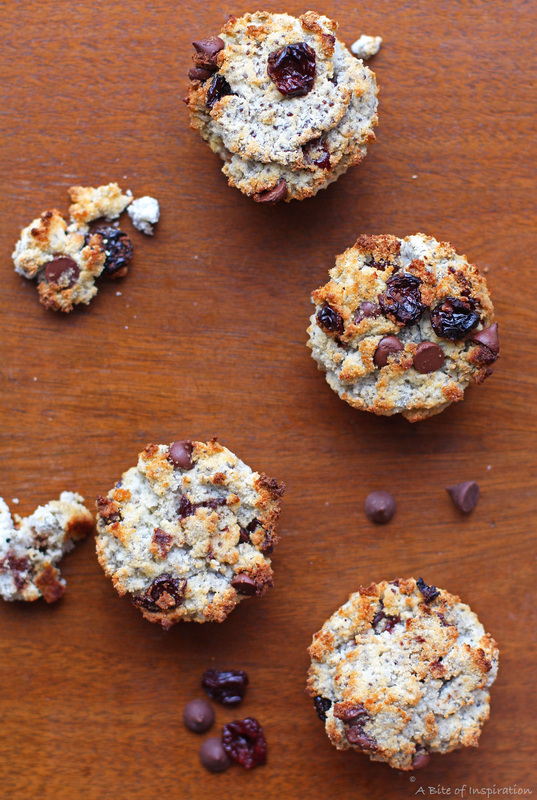 These are by far the BEST gluten-free and vegan muffins I’ve ever tasted, hands down. Gluten-free and vegan baked goods often get a bad rap for being dry, tasteless, and texturally “off”. I’ve re-made and re-tweaked this recipe many, many times until it was perfect! 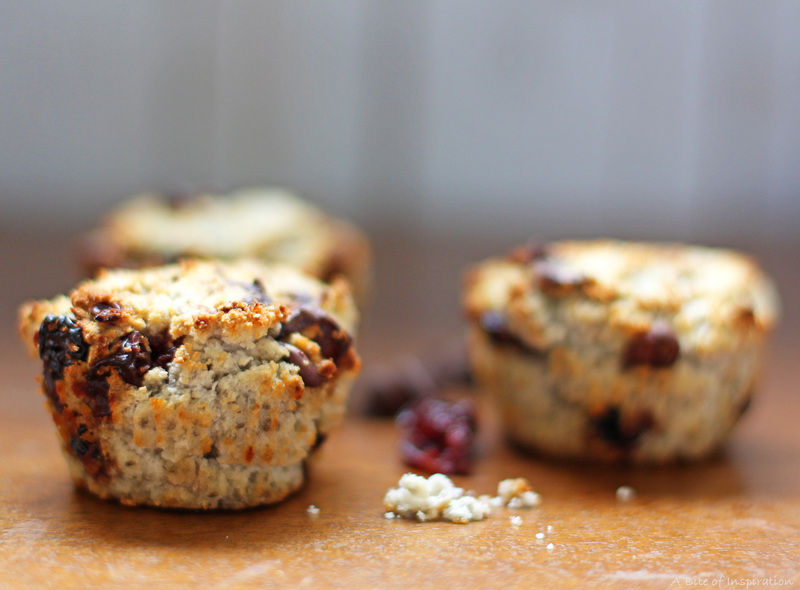 There’s no way Katie would ever eat a dry, tasteless “healthy” muffin, so why should you? These muffins are so moist, fluffy, and delicious—you won’t believe there’s no flour, eggs, or butter in them. They are soft, sweet, and everything you want in a muffin, but filled with healthy, light ingredients. The coconut oil gives the muffin a beautiful texture, while also adding a hint of delicious coconut flavor. And, don’t even get me started on all the health benefits coconut oil has (read about them here!) Plus, the dark chocolate chips and dried cherries add delicious decadence without heavy unhealthiness. It’s the perfect healthy and delicious breakfast, snack, or dessert. I could eat the whole pan in one sitting! They’re that good. Oh, and did I mention they’re super easy to make? You just mix all the ingredients together, pour them into liners, and bake. No complicated baking recipes here! The best part? You can use this basic muffin recipe as a base and add any ingredients you want to create your very own vegan and gluten-free muffin flavor! From fruit to nuts to seeds, you can add practically anything you want. Just make sure you don’t add anything with a high moisture content (i.e. frozen fruit or jam) because the extra liquid will throw the texture off. You can also replace the vanilla extract with other extract flavors (almond, orange, lemon, etc.) and change the flavor up that way. The possibilities are endless! Whether you’re a fan of “American Housewife” or not, I can guarantee you’ll be a fan of this muffin recipe! Make it for your friends and they’ll never ever guess that it’s gluten-free AND vegan—it’s that moist and delicious! Enjoy! P.S. What sitcoms do you like to watch? I’m a huge fan of sitcoms and am always looking for new ones to check out. Comment below and share! Add chia seed eggs, coconut oil, coconut milk, water, maple syrup, and vanilla into a bowl. Mix thoroughly until well-blended. Add coconut flour, baking powder, and salt in a separate bowl. Stir well to combine. Add dry ingredients into the bowl with the wet ingredients. Stir well until the mixture is smooth. Gently fold in the cherries and chocolate chips. Make sure they are evenly distributed throughout the dough. Line a 12 cup muffin pan with liners. Spray the liners with cooking spray. Fill each liner with batter. These muffins don't rise very much, so fill the liner until it's a little more than ¾ full, if you want a large muffin. Bake for 40-45 minutes, or until a toothpick inserted in the center comes out clean and the top of the muffin is golden brown. Allow to cool for 5-10 minutes before eating. Enjoy! Add chia seeds to a small bowl. Add water and stir well. Soak for 10-15 minutes until the seeds form a thick, gel-like texture. * Some people like to grind the chia seeds before adding them to the water. I actually like the texture of the chia seeds, so I just leave them whole. It’s up to you. If you want to grind the chia seeds, you can do so in a small coffee grinder. 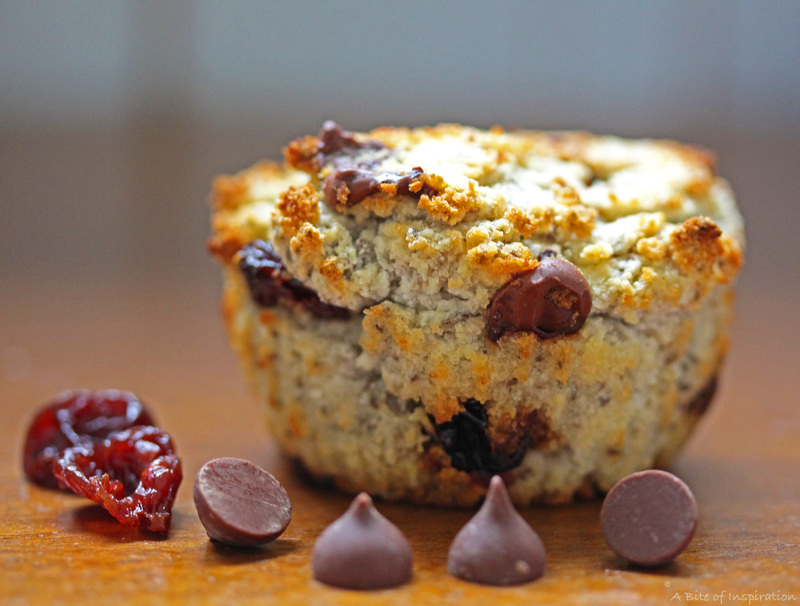 Feel free to use this basic muffin recipe and replace the chocolate and cherries with any add-ins you’d like! Most baking powders are gluten-free, but always check the label to be sure! Those look and sound amazing!! 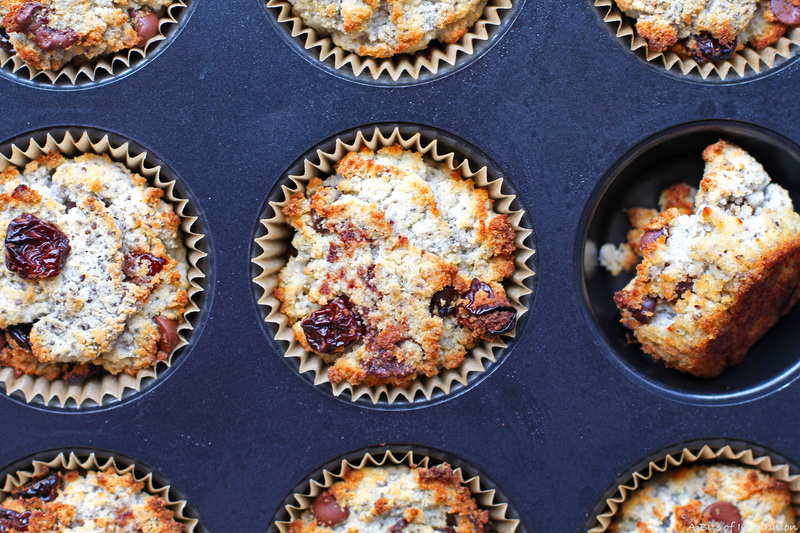 I love muffins with a crunchy top and these look fabulous! Love all the time and work you’ve put into creating a delicious muffin free from the top food allergens, I can’t wait to try these! Thank you! I’ve never heard of American Housewife before but now I really want to watch it! You make it sound like such a fun and interesting show! I checked the TV guide and saw that it airs on Tuesday nights! That’s my day off so yay! If the show is even close to as good as these muffins look, I’m sure I’ll love it. Making these muffins soon too. Thanks! Thank you so much, Jenn! So happy that I could inspire you to try out a new TV show. Be sure to let me know what you think of it. Enjoy the muffins too! 🙂 Thanks again! I have never heard of American housewife but I’m closer to Katie I think. These do look incredible, though. I’m a fan of coconut milk/oil and I’ve never tried using coconut flour so I’m keen to try that out. I love that you’ve made something so healthy with no compromise in flavour. Nice! I haven’t heard of “American Housewife” before now but I’ll have to give it a try. I love a good sitcom. Your muffins look fabulous! Even though I eat gluten (and put fatter milk in my tea sometimes, haha) I also like to eat vegan once in awhile. Especially when it’s a yummy vegan baked good! Haha I’m right there with you, Kelsie. It’s all about balance, right? 😉 Enjoy! Thank you, thank you! I made these muffins yesterday and they are out of this world! A few months ago, my doctor told me I had a gluten intolerance and I haven’t had a good soft muffin ever since… until yesterday! These are amazing! I’ve never seen “American Housewife” but I’m def going to watch it now. I used to like Fox shows a lot like “The Mindy Project”, which they got rid of. I still watch “New Girl” with Zooey Deschanel sometimes but it’s getting old. I’m going to watch the show you suggested this week. And thanks again for these awesome muffins. I’m subscribing to your blog. More awesome gluten-free recipes soon please! I used to be a fan of “New Girl” too but stopped watching after Cece and Schmidt got married. It got kind of boring to me after that. “American Housewife” does have some of the same humor that the Fox shows do. Definitely give it a try and let me know what you think! Thanks again for stopping by! Always happy to welcome a new subscriber! Chocolate and cherries are 2 of my favorite combos. Can’t wait to try this recipe. Cherries and chocolate are a winning flavor combination. I have never heard of making chia seed eggs but what a great idea to keep things vegan. This recipe looks like a winner in my book. i typically shy away from vegan baking (it’s the egg substitute that makes me nervous; is it going to rise right? are the chia seeds going to make it crunchy?! ), but as a sucker for cherry garcia ice cream, this flavor combo sounds so good. and all that coconut oil and milk sound like they’d add a nice undertone of coconuttiness! will have to try them, even if they scare me a bit lol. Haha I totally understand your fears, Heather! I’ve had some bad experiences with vegan and gluten-free baked goods in the past, myself. But, I promise you, there is absolutely nothing to fear with these delicious muffins. They don’t taste gluten-free or vegan AT ALL! The chia seeds don’t add any crunchiness, but if you’re worried, just grind up the seeds in a clean coffee grinder and problem solved! The muffins don’t rise very much, but I just fill up the cupcake liners a little higher than with traditional baked goods and I still get a nice, solid muffin. I’m glad I inspired you to conquer your fears of vegan/gluten-free baking, Heather! I promise, everything will be okay. 😉 Be sure to let me know what you think! Yum! Chocolate and cherry are one of my favorite flavor combos! love american housewife. funny show. thanks for this recipe. looks good. Thank you, Frank! Glad to connect with another “American Housewife” fan. Enjoy! 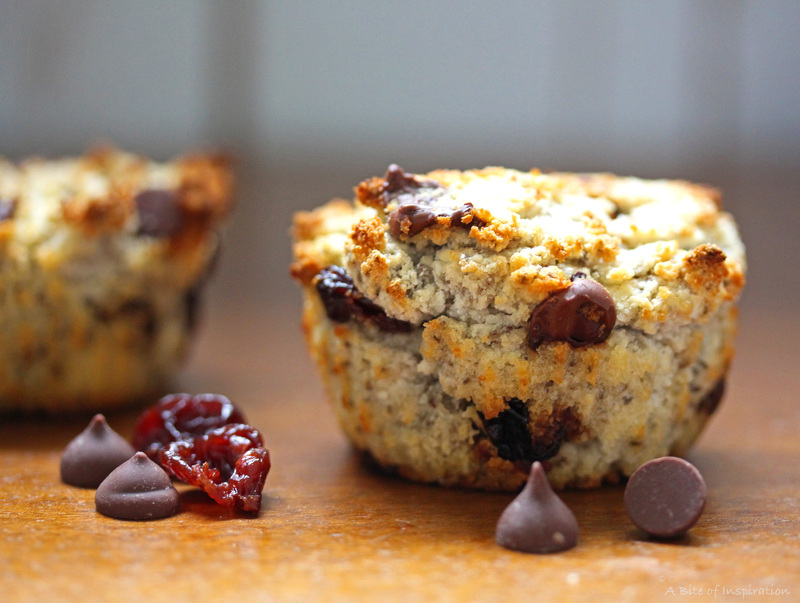 Muffins are such a great snack or breakfast. I love the chocolate chips you added to these. Yum! Those muffins look like treats everyone can enjoy! They’d be perfect for a group with different allergies and food restrictions. And all without having to give up chocolate. Thank you, Anne Marie! Yes– they’re definitely perfect for a group! Nowadays, with so many people suffering from allergies, it’s great to have a one-size-fits-all treat that everyone can enjoy. Thanks again for stopping by! Hahaha that quote about the half milk and half fatter milk made me laugh. Great show! Love these muffins too. I made them the other day and they are yum. I used honey instead of maple syrup and they were still delish. Yummy yum.